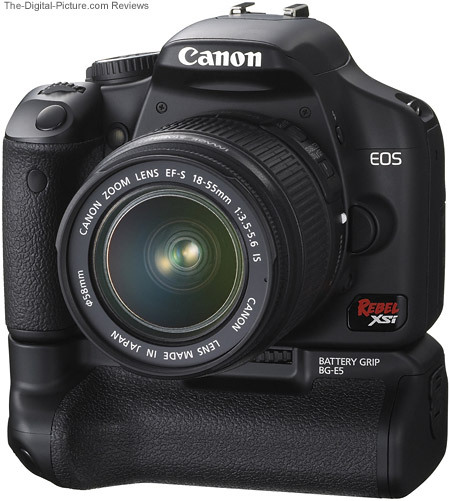 The Canon BG-E5 Battery Grip is a great accessory for the Canon EOS Rebel XSi / 450D and Canon EOS Rebel XS / 1000D DSLR cameras. I personally shoot in vertical/portrait orientation as much as in horizontal/landscape orientation. Having the vertical grip allows me to shoot from a much more comfortable and much more stable position - and gives me more control over larger lenses. The BG-E5 makes the grip on these small compatible cameras nicer to use - especially for long sessions in vertical orientation. 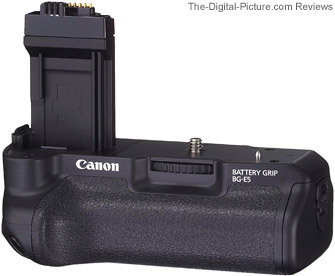 The BG-E5 accepts two Canon LP-E5 Battery Packs or six AA batteries in the included holder. Two LP-E5s yield twice the number of shots as one before a charging is needed - a very nice benefit. A second battery is not required - The BG-E5 works fine with a single LP-E5. The BG-E5 installs into the DSLR's battery compartment. The original battery door is easily removable and the BG-E5 plugs in. The attachment is completed by screwing the BG-E5 into the camera's tripod adaptor threads. The BG-E5 provides its own tripod adapter threads - this functionality is not lost. The battery grip provides controls and shutter release identical to the camera's grip. The only Canon BG-E5 Battery Grip downside I can think of (other than having to purchase it) is the extra size and weight it adds to the camera body. The BG-E5 measures 0.5 x 3.8 x 2.8" (128 x 96.4 x 70.7mm). It adds 1.63" (41mm) to the height of the camera when attached. It weighs 8.1 oz (230g) without batteries. One of the benefits of the BG-E5-compatible DSLRs is that they are small. When "small" is your top priority, simply remove the BG-E5 and put the battery door back on. It is easy and quick. I have been using the BG-E5 on the XSi I reviewed and will be moving it to the XS as I review it. My only complaint is that my middle finger rests on the attachment wheel in the front, but it is not a significant issue in my opinion. Otherwise, it works great - It is a worth-having accessory.